Becoming more experienced in creating more intricate, decorative crocheted items involves crocheting more complicated stitches. An alternating block stitch, for example, is one of the basic stitches used for several decorative patterns to make items such as table clothes, sweaters or shawls. Most crochet makers, whether beginners or advanced, know how to construct an increase in simple stitches like double or single crocheting. However, knowing the technique of increasing a rows or a stitch can seem a little difficult. Making crocheted items with the alternating block stitch doesn’t have to be complicated. 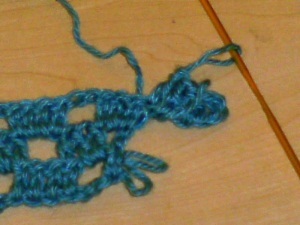 For instance, the alternating block stitch consists of increasing rows. 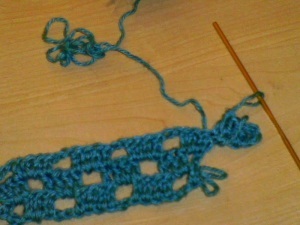 Make a sample piece of 3 rows of alternating block net stitch. Work a foundation chain that consists of multiples of 6 +3. Thus, you multiply 3 times 6 then add 3 additional stitches for a total of 21 stitches. If you want to repeat any additional stitches, use the formula to add more stitches. · Chain 5, dc in the eight chains from your hook then works a dc in the next 3 chains. This is the first block. * Chain 2 and skip the next 2 chain of your foundation row, work one dc in the next 4 chains –second block completed. * Repeat from * to * across the row to the last chain 3, chain 2, skip 2 chains then dc in the last chain. Chain 3, turn. Your turning chain is the first stitch on the next row. Row 1 completed. · Continue to work your sample piece in rows of alternating blocks of 4 dc. (Dc in dc, 2dc over ch-2, dc in dc) the ch-2 will form your open squares. · Increase row: dc in the 4th chain from hook then dc in next dc ch, work 1 dc in the first dc of your last row. One block added or increased to the row. Continue in alternating block net stitch across the row to the end of your row. · Increase a number of blocks: Chain 5. For each extra a pair of blocks crocheted adds an extra 6 chains at the end of your row for a total of 11 chains added to the first block. This will produce a block plus an open space. · Work increase at end of row: * yarn over (yo), insert your hook under the yarn of the last dc and draw up a loop, yo and draw through the first loop on your crochet hook, work the rest of the dc in the regular manner of alternating net stitch*. · Repeat from * to * 2 more times to complete block. Work a turning chain and continue in alternating block stitch for the next row. The asterisk is for repeating several rows or stitches. When adding additional stitches to the design, make sure that the multiplication and addition is correct. Any mistakes in counting will result in blocks that won’t line up properly.